With the Spring game kicking off tonight (and this presumably being the last sports article I ever write), I have been reminiscing upon my time watching Tech football since I set foot on campus in 2008. I was fortunate enough to be here for Paul Johnson’s first season at the helm and see how the team has evolved over the years. Analyzing how each season has gone year by year, it’s easy to look at Johnson’s season-by-season record over the years and say that the team isn’t capable of winning like they used to. Diving into deeper analysis, though, has shown me that while Tech’s record the last three seasons hasn’t been stellar, there are signs of progress under Johnson that should give fans something to be excited about for the next few seasons. Johnson’s first season was a special and unforgettable one in the Tech community. We beat the hated Bulldogs 45-42 and won nine games despite being picked to be a bottom feeder in the ACC. He instantly became one of the hot coaches in the country, and proved the doubters wrong about his “gimmicky” spread-option offense. He then continued that success in the 2009 season behind workhorse quarterback Josh Nesbitt, and stud running back Jonathan Dwyer. Nesbitt and Dwyer became stars in the league, dishing out punishment on defenders and putting up ridiculous individual stats. It was an exciting time to be a Tech fan, and expectations soared to ridiculous levels. This was to be expected after the quick ascension to a conference title contender, but consistency as a ranked team was not something that the Jackets were ready for. Johnson had not built enough depth for his system in his recruiting classes and it showed the next season. 2010 was a disaster in the eyes of most fans and the theme of the last two seasons seemed to be mediocrity. 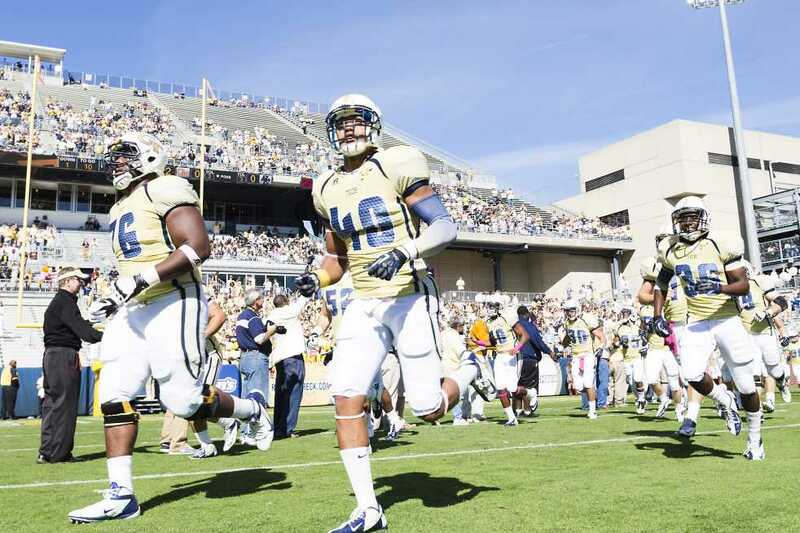 But looking into the team’s offensive statistics from the 2011 and 2012 season actually should provide Tech fans a semblance of hope for the future as it appears the Jackets are poised for several seasons as an offensive juggernaut within the conference. The past two seasons have been Tech’s most productive in total offense in Johnson’s five years, and there are notable improvements coming soon under center. Johnson has found himself a stable of dynamic and capable quarterbacks that should continue to compete over the next three or four seasons. Fans already have seen a glimpse of projected starter Vad Lee as he split time with Tevin Washington last season. Lee, along with his competition Justin Thomas, bring athleticism to the quarterback position that we haven’t seen yet in this offense. Couple that with the new wrinkles Johnson has added to the offense, and we could be in line to see some of the most exciting offensive teams in Tech history. Last season was the first time in the last five years that the starting quarterback completed over 50 percent of his passes (which is kind of surprising considering how long Washington’s passes floated in the air). Both Lee and Thomas are more accomplished passers than Nesbitt or Washington were, and that could make all the difference. Johnson added in the pistol package to the offense last season, which added a mid-range passing game to the offense that was lacking in the past four seasons. Offense isn’t everything, though. The defense has been a disappointment since Johnson’s arrival. If the defense makes the expected strides under new coordinator Ted Roof, we could be in line for some special upcoming seasons.